In April 2012 the Pew Research Center found for the first time that more than half of older adults (defined as those ages 65 or older) were internet users. Today, 59% of seniors report they go online—a six-percentage point increase in the course of a year—and 47% say they have a high-speed broadband connection at home. In addition, 77% of older adults have a cell phone, up from 69% in April 2012. Seniors, like any other demographic group, are not monolithic, and there are important distinctions in their tech adoption patterns, beginning with age itself. Internet use and broadband adoption among seniors each fall off notably starting at approximately age 75. 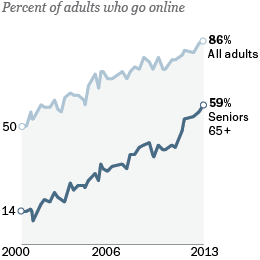 Some 68% of Americans in their early 70s go online, and 55% have broadband at home. By contrast, internet adoption falls to 47% and broadband adoption falls to 34% among 75-79 year olds. 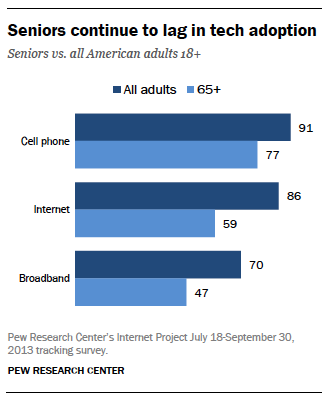 Fully 87% of seniors with a college degree go online, and 76% are broadband adopters. 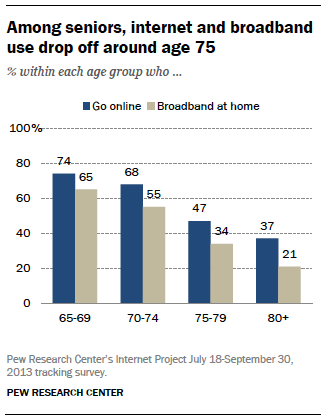 Among seniors who have not attended college, 40% go online and just 27% have broadband at home. Physical challenges to using technology: Many seniors have physical conditions or health issues that make it difficult to use new technologies. Around two in five seniors indicate that they have a “physical or health condition that makes reading difficult or challenging” or a “disability, handicap, or chronic disease that prevents them from fully participating in many common daily activities”. This group is significantly less likely than seniors who do not face these physical challenges to go online (49% vs. 66%), to have broadband at home (38% vs. 53%), and to own most major digital devices. Skeptical attitudes about the benefits of technology: Older adults who do not currently use the internet are divided on the question of whether that lack of access hurts them or not. Half of these non-users (49%) agree with the statement that “people lacking internet access are at a real disadvantage because of all the information they might be missing,” with 25% agreeing strongly. But 35% of these older non-internet users disagree that they are missing out on important information—and 18% of them strongly disagree. Difficulties learning to use new technologies: A significant majority of older adults say they need assistance when it comes to using new digital devices. Just 18% would feel comfortable learning to use a new technology device such as a smartphone or tablet on their own, while 77% indicate they would need someone to help walk them through the process. And among seniors who go online but do not currently use social networking sites such as Facebook or Twitter, 56% would need assistance if they wanted to use these sites to connect with friends or family members. Despite some of these unique challenges facing the older adult population when it comes to technology, most seniors who become internet users make visiting the digital world a regular occurrence. 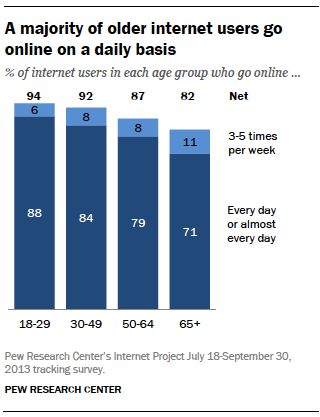 Among older adults who use the internet, 71% go online every day or almost every day, and an additional 11% go online three to five times per week. Few older adults are smartphone owners: More than half of all Americans now have a smartphone, but among older adults, adoption levels sit at just 18%. Additionally, smartphone ownership among older adults has risen only modestly in recent years, from 11% in April 2011. A significant majority of older adults (77%) do have a cell phone of some kind, but by and large these tend to be more basic devices. Among older adults, tablets and e-book readers are as popular as smartphones: Among the general public, smartphones are much more common than either tablet computers or e-book readers, such as Kindles or Nooks. But tablets, e-book readers, and smartphones are each owned by an identical 18% of older adults. In fact, the proportion of older adults who own either a tablet or an e-book reader is actually larger than the proportion owning a smartphone. Some 27% of seniors own a tablet, an e-book reader, or both, while 18% own a smartphone. Today 46% of online seniors (representing 27% of the total older adult population) use social networking sites such as Facebook, and these social network adopters have more persistent social connections with the people they care about. Some 81% of older adults who use social networking sites say that they socialize with others (either in person, online, or over the telephone) on a daily or near-daily basis. Among older adults who go online but do not use social networking sites, that figure is 71%; and for those who are not online at all, it is 63%.